The Most Badass Fish in the Sea – Ya Like Dags? You might think that the title of this post refers to the spiny dogfish (Squalus acanthias), the main species of interest for this blog. You’d be wrong. You’d also be wrong to guess the great white, as badass a shark as that is. This post is dedicated to a shark that, despite its relatively average size (by large shark standards), makes its living eating prey that are themselves infamous for being voracious predators. This post is dedicated to the velociraptor of the sea, the shortfin mako (Isurus oxyrinchus). A maximum-size mako clocks in at about 12-15 feet, which is pretty impressive in general fish terms, but isn’t quite up to the 18-21 feet documented for the big, dangerous sharks like whites and tigers. A 10-foot mako would be considered rather large for the species, and an average-sized adult is probably somewhere between 6-8 feet. However, makos are not well-known for their size, but their speed and agility. The maximum speed attained by a charging mako has yet to be reliably recorded, with potential bursts of up to 46 mph. This makes it certainly the fastest shark, and possibly the third-fastest fish in the ocean, behind only the sailfish and bluefin tuna. In fact, other large, fast pelagic fish make up a decent chunk of the mako’s diet, especially when they can be picked off after being hooked. Makos are probably a fisherman’s favorite shark to have on the end of a line, both because the meat tastes like swordfish but better and because they put up spectacular fights, leaping in the air and occasionally turning around to attack the boat. This is one shark that really lives up to its reputation. Anything dolphins can do sharks can do better. Except maybe breathe air. Image from newenglandsharks.com. If a predator can be judged by its prey, then makos are among the elites in the shark world. Stillwell and Kohler (1982) identified blue sharks, swordfish, large tuna, and sea mammal remains among the stomach contents of mako sharks along the U.S. east coast, but the diet was dominated by bluefish (Pomatomus saltatrix). Bluefish are among the most voracious predators in Atlantic coastal waters, attacking in large schools and chopping up menhaden and herring nearly as large as themselves. According to Stillwell and Kohler (1982), the Atlantic mako population consumes about 14.5 % of the entire bluefish stock per year. Bluefish remained extremely important to the mako diet when it was updated by Wood et al. (2009). Using updated estimates of the metabolic needs of these warm-bodied sharks, Wood et al. (2009) found that an average-sized mako needs to consume about 4.5 % of its body weight per day. This leads to an annual consumption of 500 kg (1,102 lbs for the non-metrically inclined) of bluefish per shark. The importance of bluefish in the diet has remained constant despite fluctuations in bluefish abundance, suggesting that makos in the Atlantic seem to have a particular affinity for these vicious prey. In the Pacific, makos may be an important regulator of the infamous Humboldt squid (Doscidicus gigas). Humboldt squid are the third-largest cephalopod on the planet and occur in much greater numbers much closer to shore than either giant or colossal squid. They’ve also recently shown significant increases in population and expansions in range. In the past few years, Humboldt squid have occurred as far north as Alaska, where they may pose a threat to valuable Pacific salmon stocks. It’s thought that a combination of climate change and declining predator populations have lead to this explosion of squid. Fortunately, the Pacific mako population is on it. Like sperm whales, shortfin makos show scars from battles with large squid. From Vetter et al. (2008). Vetter et al. (2008) used data from just about every research technique available to study interactions between the mako and Humboldt squid populations in the California current. 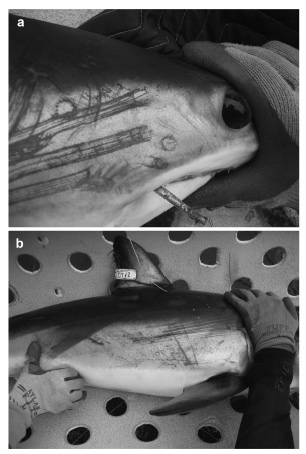 These included gut content analysis, identification of squid scars on makos, archival satellite tagging to compare the horizontal and vertical movements of both predators, and even plankton surveys to check patterns of recruitment for shared fish prey. They found that Humboldt squid make up about a third of the mako diet, and that there is some dietary overlap between the two. The sharks they tracked made a few dives into the Oxygen Minimum Zone (OMZ), where Humboldt squid lurk when they’re not hunting, but didn’t stick around for very long. Since something as large and fast as a mako needs a lot of oxygen, the OMZ probably presents a refuge area for Humboldt squid. Vetter et al. (2008) suggested that most mako/squid interactions probably happen when the Humboldts rise out of the OMZ to feed. Perhaps most badass of all, Pacific makos are frequently covered in battle scars from the last moments of those tasty squid, which means the titanic battles between sperm whales and giant squid have a smaller, faster counterpart. In conclusion, makos are voracious predators of voracious predators. The only chink on the mako’s badassery is that they’re occasionally preyed upon by orcas, which you could read as “it takes an orca to take down a mako.” When the cephalopds finally invade land and depose humanity, it will be because they were trying to escape from the sharks. A very cool species of fish. My biggest on a rod is 320 pounds (actually my brother caught it but I stood next to him cheering him on). The biggest that I’ve seen was on the southeast part of Georges, in a 1000 fathoms, fish was 920 pounds. We caught it in a gillnet while swordfishing. I cut the jaw out–made a mess of that job–but ended up with a decent set of jaws. The jaws, however, were stolen from my backyard, when I had the jaws drying in the sun. I was at URI then and was sure I had that greatest summer souvenir of any student. Damn kids. I have to agree. We used to catch them while handlining tuna south of the Vineyard. Although we could sell them, we never wanted them in the (23 foot) boat. We would laugh watching one tear up the deck hands in the boats around us until it happened to us! The largest one we were ever hooked up to put on quite an aerial show before it broke off. We were actually happy to see it go. Any chance that makos hunt around sperm wales and form a opportunistic semi cooperative relationship? The whales are known for going deep and squid would likely try to flee the echolocation of the whales. If the whales are deep, hunting the OMZ, it would seem to be logical for makos to patrol the area above and the upper edges of the OMZ to take advantage of squid making a run for it. And, of course, any squid wounded by the makos would be easier prey for the whales. Any tendency for conflict between whale and shark could be terminated by the whale grabbing the lion’s share and carrying it too far into the OMZ for the sharks to follow. Sort of a win-win with a ready mechanism for sorting things out without having to resort to a bloody fight. I don’t know if such a relationship exists, but it would certainly be possible any place where you have makos, sperm whales, and squid in the same area, even if it was just coincidental. All three species are tracked by the TOPP (Tagging of Pelagic Predators) program, and tracking and archival tag data for makos and squid went into the Vetter et al. paper discussed in this post, but I don’t think anyone has put together anything on all three yet. It would certainly be a badass study, and could be doable with archival tags and a decent amount of funding. Wow, with such a heavy reliance on one species, it would seem that bluefish population fluctuations have the capacity to severely influence shortfin mako numbers. Has anyone speculated on this relationship? I’m not sure what other species a mako could prey on to reach 500 kg in a year. Thanks for the comment Dave. The heavy reliance on bluefish in the Atlantic does seem to be an obvious problem. The authors attempted to tease that apart in the paper but changes in the mako population seem to be more a result of fishing pressure than food availability. There’s some evidence that spiny dogfish have become more important in the mako diet recently, and they’re not above preying on menhaden and herring. Odds are they could make up for a lack of bluefish by eating some other abundant species, but they might not get as much nutrition out of it. Pingback: Notes on Some of Those 79 “New” Shark Species | Ya Like Dags?